BEFORE: Second day of advanced screenings this week with Chasing Mavericks. I don’t know as much about this film going into as I did Cloud Atlas but I can say it also has co-directors, Michael Apted and Curtis Hanson, and it stars a mostly unknown, to me at least, cast with the exception of Gerard Butler. I also overheard some conversations waiting for Cloud Atlas and the general consensus was Chasing Mavericks is a “decent surfing movie”. Let’s see how accurate that assessment is. AFTER: Initial thoughts: the moviegoers last night hit the nail on the head. 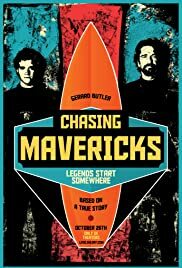 Chasing Mavericks is a decent surfing movie. It’s not horrible, but there’s also not much to love either. As I was walking back from the theater, I began to formulate my thoughts as I always do. Decent was the word that immediately came to mind but I couldn’t think of why. There was something I didn’t like about the film but I just couldn’t put my finger on it. As I entered my dorm building, the reason finally hit me: there are a lot of unnecessary and underdeveloped characters and storylines. The main story revolves around Jay Moriarty (Jonny Weston) who wants to surf the mythical/legendary Maverick waves which reach 30-40 feet high according to the film (up to 80 feet according to Wikipedia). The other main character is Frosty Hesson (Gerard Butler) who teaches Jay the skills needed, both body and mind, to surf the waves. There are a host of other characters including Jay’s mom (Elizabeth Shue), friend Blondy (Devin Crittenden), love interest Kim (Leven Rambin), the local stoners, and Frosty’s family. That’s a lot of secondary characters, and being based off a true story, I won’t deny that they were important to Jay in some way. But the way all these characters and their relationships are portrayed in the film leaves a lot to be desired. Frosty’s family was probably integrated into the film the best. They were shown fairly frequently and played a significant role in the film. But all of Jay’s friends and relationships seemed superfluous. The mom just sort of tags along for the ride; Jay’s father who deserted the family was more important to the story and you never even see him once. And the rest of Jay’s friends seemed even more out of place. His best friend Blondy especially had a storyline that went completely nowhere. You see him get involved in drugs (which is how the local stoners are pulled in) and it repeats a few times throughout the film. But there is no resolution, no conclusion of any sort. This conflict is introduced and is then left dangling leaving me the viewer puzzled as to why it was included in the first place. This trend is seen with Jay’s love interest Kim, who has more of a complete circle in the film, but there are still gaps missing. Now don’t get me wrong, the film isn’t the worst thing ever. In fact there are some very good parts to it as well. The best one that comes to mind is the ending. It is very predictable and many of the things that happen are quite common in stories like this. But I must give credit where credit is due; while predictable, the ending is still very suspenseful. Even knowing what’s going to happen before it happens, I still found myself leaning forward in my seat and rooting for Jay to succeed. Decent is the perfect word to describe Chasing Mavericks. There was a lot of bad in the film (read my two paragraph rant above if it didn’t sink in the first time). But there were a handful of redeeming qualities that made the film somewhat enjoyable to watch. This is definitely not a film you need to see in theaters, especially with Cloud Atlas opening opposite it this Friday. But if you are a surfer, or just have heard of this story, it might be an interesting film to watch. Chasing Mavericks opens in theaters this Friday, October 26.